If you don’t know, then now you know. Ja Morant is the real deal. 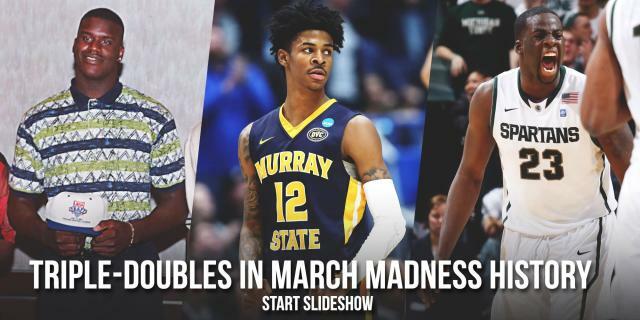 The Murray State wing entered the NCAA tournament with the most hype this side of Zion Williamson. But unlike Williamson, Morant hasn’t dominated national TV time while playing for a mid-major team despite being touted as a top-three pick in the upcoming NBA draft. Those who tuned into Morant for the first time on Thursday were not disappointed. Marquette entered the game as the No. 5 seed and favorite against the 12th-seeded Racers. But they didn’t look like it. Morant led the way for the Racers with 17 points, 16 assists and 12 rebounds in a dominant 83-64 win to advance to the NCAA tournament’s second round. It marked the first triple-double in NCAA tournament play since Draymond Green logged one for Michigan State in 2012. It was the ninth triple-double in NCAA tournament history. And he put on a show while doing it. Morant actually fell short of his season scoring average of 24.6 points per game. But he more than made up for it as a distributor, with his 16 assists being the second-most in NCAA tournament history. When asked about what made him most proud about his performance, Morant told CBS it was getting his teammates involved. “Sixteen assists,” Morant said. “That’s one of my favorite things to do. Just to see smiles on my teammates’ faces. Just being able to make plays and build their confidence. I’m proud of that. Three other Murray State starters scored in double figures with Tevin Brown logging 19 points and 6 rebounds, K.J. Williams posting 16 points and 4 rebounds and Shaq Buchanon tallying 16 points, 4 rebounds and 3 steals. Morant outdueled Marquette’s Markus Howard, who came into the NCAA tournament as the only tourney player averaging more points than him. Howard posted 26 points for the Golden Eagles, but was mostly absent elsewhere in the box score with 1 rebound and 2 assists. The Racers advance to take on Florida State on Saturday with a trip to the Sweet 16 on the line.